I wavered for a long time before taking up the Knitting Olympics Challenge. I did not know what to knit since the Olympics are all about a challenge, about pushing the limits a bit and this was difficult decision, because I would have loved to knit something very simple to be able to actually watch some of the games. First I thought that I would skip this Madness (right now it is beginning to feel like that a bit)altogether but then really wanted to be part of the event. I am not sure if I am able to do what I planned but I will try to design and knit four pairs of hand wear during these weeks. In the first day of the games, I created four empty project pages in Ravelry and named them as Olympics Challenge I II III and IV. I plunged into the first project just grabbing small needles and casting on for simple gloves. I did not have a very good idea what I was to do when the knitting was done but I could not waste too much time thinking and planning. 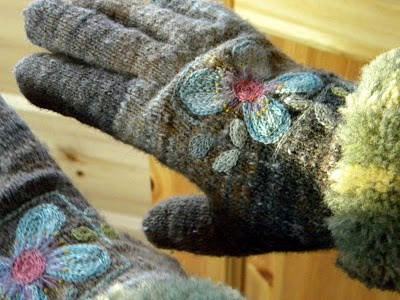 This pair is very much like the previously made embroidered mittens so the first round went fairly quickly. No big mishaps, not very much to talk about. Enjoyed the embroidery a lot and made a mental note about doing more in the future, since I really feel it is my medium. I used Kureyon Sock Yarn and small needles, 1,75 mm (US00) because I wanted to create dense fabric for the embroidery. 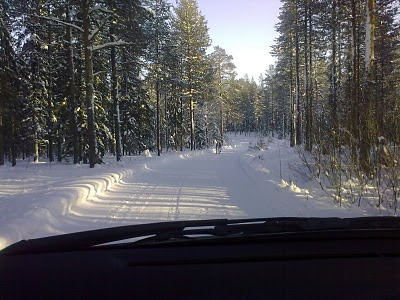 He run slowly in front of the car for few meters before decided to jump off the road into the woods. High pressure has been over us which means clear sky and cold temperature, I believe last night it was over -30 C. But the sun and light are back up here! Which is really great! Ok, back to challenge number II! Your embroidery on the glove is beautifully rustic. It inspires me, although my skills wouldn't do it justice. The glove is truly charming. Like the colors you chose for the gloves and your creative embellishments always amaze me. I'm sticking to small projects too - finishing up miittens & plan on a hat next. 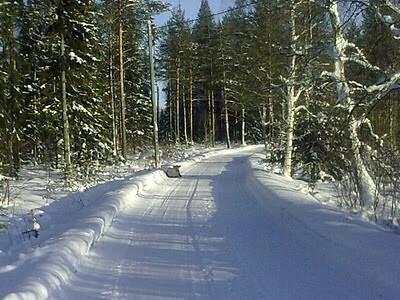 Your winter looks like our winter :) Thanks for sharing. Your gloves are beautiful! Good luck with your challenges. I hope to make something with this yarn soon, thanks again for the inspiration! I am so pleased you had your camera to share this reindeer in the sun...very sweet! You are so lucky and I am happy for you. WOW the gloves are amazing. Bless him such a shame to make him get up from his sunbathing. I love your "challenge I" result, the unevenness makes them look well loved and worn, which I find is a good thing! Gorgeous embroidery!! 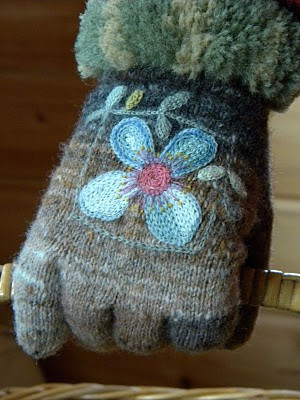 Those embroidered mittens are so beautiful! I love the combination of colors, and the lovely way they look made by hand, but not homemade. The mittens are so beautiful! I like the tone-in-tone stitching of the flowers! Nice work. We too are enjoying the return of the sun on the other side of the Arctic (in Alaska). And I too had to answer the call of the Olympic Knitting challenge. Outstanding! Your work is so beautiful! Thank you for the pictures of your world, too. What lovely gloves. The embroidery is a beautiful touch. I always enjoy the pictures you add to show us life way up north. Yet another pair of beautifully knit and embroidered pair of gloves! I think you should get extra points for the great inspiration you give us. I love your gloves. Truly a work of art. Good luck with your knitting challenges. I too am taking part in the Ravelry Olympic challenge but I'm only knitting the humble toe-up socks on circular needles (my first attempt at using circulars to knit socks). I love your mittens. ! !Reading your blog is always so inspirational. Absolutely adorable gloves! Love the whole rustic look and the embroidery. Bravo! I admire your embroidery work so much and this is a good chance to ask you if there is a book that would teach this method. Somehow your large sections, like the flower petals, look like they are knitted instead of any embroidery stitch I am familar with. How do you do this? Those gloves are so beautiful I like your embroidery on it! What amazingly beautiful work you do! I wonder how you manage to embroider the gloves? Do you put a piece of cardboard inside, to keep from accidentally stitching the two sides together? I remember trying to embroider the legs of a pair of jeans back in 1972, and that it's really tricky to embroider when you can't reach your hand inside to control the stitches from the back. Apparently you have mastered the trick! Nice gloves, I always enjoy the whimsical nature of the embroidery. I also love the cuffs. I have, for a very long time, wanted to knit some gloves or mitts with this type of cuff. The two books I have that feature this type of cuff are both in languages I don't read, Norwegian and Japanese. So I have never really figured them out. Perhaps, if you have the time and desire, you might give us a visual tutorial on making this type of cuff. I am eager to see the results of your Olympic challenge. Good knitting Lene! The gloves are masterpieces. So beautiful!!! Your Olympic gloves are gold medal winners - really beautiful! And you knit them so quickly. Oh my! I am enchanted by the reindeer creature. What a treat. I'm from Canada and I enjoy clear cold winter weather, as it reminds me that I am alive. Do you feel the same? The gloves are lovely. Your embroidery adds such a personal touch. I'm getting out my needles now... newly inspired. Your work is stunning, as always. Like Ann in Montreal, I am very interested in learning to do this type of cuff, and have not been able to decipher the instructions that I have in Norwegian. Is there a source for instructions in English? Or would you be willing to illustrate it? What is the technique called? I would be willing to do a search, but don't know what to call it. Many, many thanks. 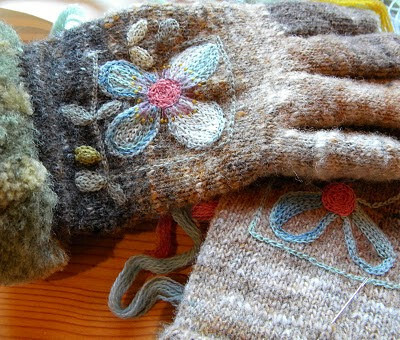 I love these gloves, and can't imagine being able to simply pull out some yarn and needles and produce them. Add me to the list of people who love the cuffs and would like to know how to make them - what is the technique called? Beautiful embroidery as always - you have such a special gift! I wish I was clever enough to make some too. Your knitting skills are far greater than mine, although I just finished a pair of complcated socks.... the Through the Loops October chanllenge pattern. SO - how long is the sun up these days? I was reading the special issue of Piecework today and enjoying the description of "Sawtooth Mittens". The author made me think of you - accomplished Finnish knitter, knitting north of the Arctic circle..... Then I realized that you ARE the author of that section - congratulations - very interesting. Beautiful glove. I love the texture of the embelishments. Just perfect. I too would love to know how the cuffs are done. Is this done while knitting, or is it applied afterwards? Lene, I love all your work, but the pieces that make me catch my breath, literally, are your embroidered mittens and gloves. Those are just stunning! You are such an artist. 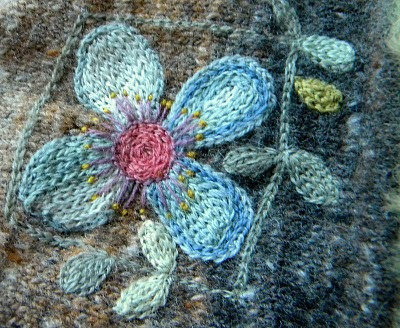 I love the combination of colours between the Noro yarn and the teals and blues you chose for the flowers (did you use your usual source for embroidery wool?). Which Noro colourway was that, if you don't mind me asking?